Hearing rats scurrying and scratching at night in your attic is certainly not a pleasant occurrence. Stop them from keeping you awake by getting in touch with our specialized team. We have more than ten years of experience in the pest control industry, and we can inspect your home thoroughly before deciding on the best solution to eliminate rats from your attic. We will seal and block all of the entry points and make sure the pesky rodents are out permanently. Having your attic sealed correctly is essential if you want to prevent hot air from escaping from your home. Moreover, air leaks can be a source of bacteria developing. Our expert technicians will inspect your attic to find all air leaks, including in insulated parts. Even though some of the holes are more visible than others, we'll make sure we find and seal them all. If you also have trouble with rodents, we'll use wire mesh or steel wool to keep them out while sealing the air leaks. 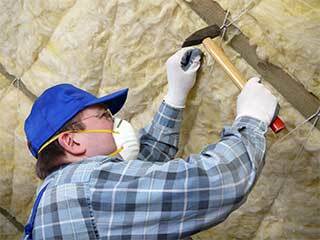 Whether you need to have your attic insulation removed because of water or fire damage, or simply because the existent insulation is too old, we can come in and discuss whether it needs replacement or topping off. If we need to take out the insulation, we usually do it with powerful vacuums or we remove by hand. We cover the insulation of both walls and floor, and sometimes we are able to reuse some for a new installation. Spot removals are also available for those situations where we don't actually need to remove the insulation in the entire attic. Call Attic Cleaning Los Angeles, CA today to get help to restore your attic to like-new condition.